Disappointing to say the least. I installed the beta version of iOS 4.3 on my iPad this morning hoping to try out the new multi-touch app switching, but it seems I’m not going to be that lucky. Whilst the setting of my devices have been updated correctly, the switch for multi-touch just isn’t there! The orientation option has been added so that’s something at least. However, I’m expecting a multi-touch switch too, which is absent. Anyone got any idea why I cannot see this switch? I’ve managed to get this working! I enabled “Development Mode” on my iPad using XCode’s organiser. 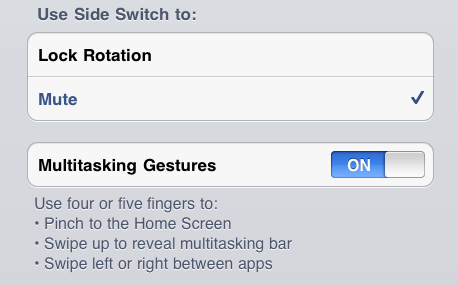 I now have the full multi-touch gesture support! I must admit, it’s pretty slick! ← My first iPhone application has just been approved!